I thought long and hard about writing this blog post, carefully considering potential ramifications and public backlash. Then I remembered Dr. Seuss's Lorax: "Unless someone like you cares a whole awful lot, nothing is going to get better. It's not." So stand back, I'm going to open my big mouth. 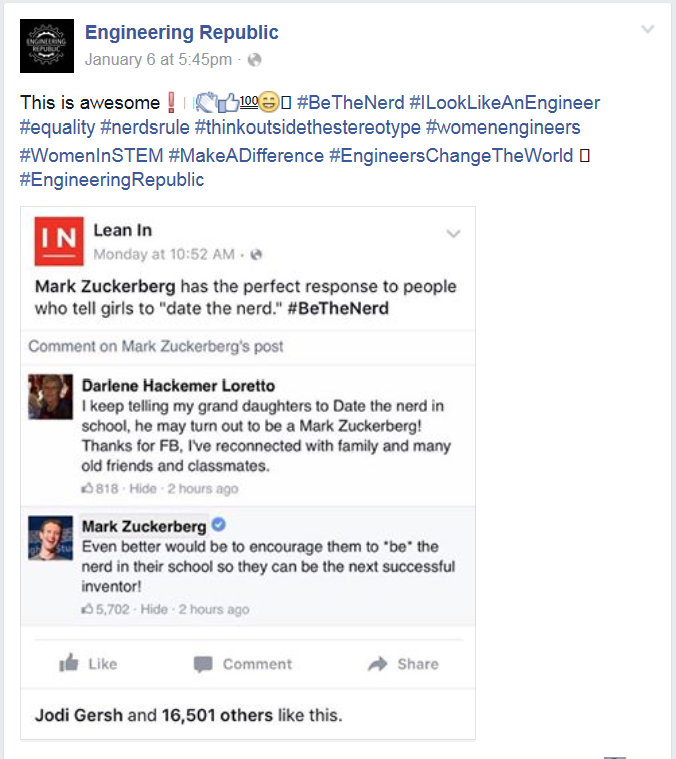 Engineering Republic, a generally respectable discussion forum, about engineering, for engineers, by engineers, has a solid social media presence on multiple platforms. 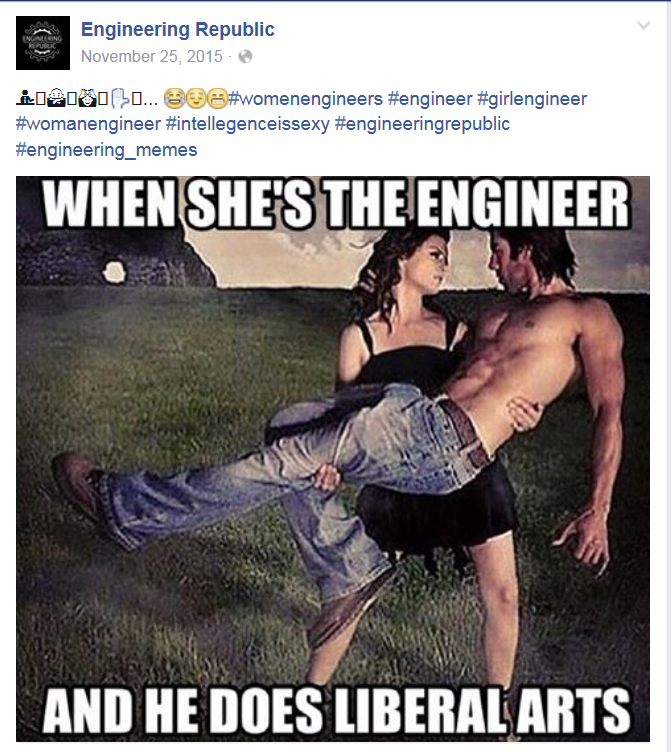 Their posts and memes are usually gender-neutral, accepting, and positive, as we in the engineering study and profession all commiserate about challenging classes, difficult professors, tough projects, sleeplessness, excessive stress load, and the hair-raising hijinks that come with the territory. However, this little gem greeted me 12 Jan 2016. This tweet was also part of a screencap on Instagram, in a "Follow us on Twitter" social media cross-pollination campaign, therefore it was seen by many more than just their Twitter account followers. The Instagram post was reported by someone (not me), and had been deleted by lunchtime that day. But the tweet remains, and has been published for three days. It is my fervent hope and belief that this tweet had to have been an oversight by the social media team. Still, it slipped through, which is not cool, guys, not cool at all. While I don't mind some crass humor, and even claim to be "one of the boys, with better shoes", this is beyond the pale. Even my husband, who is as unabashedly non-PC as they come, blanched as it set off alarms in his head. 1. 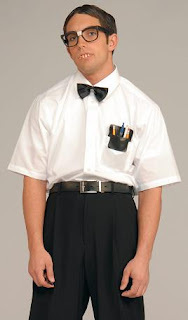 Conduct themselves honorably, responsibly, ethically, and lawfully so as to enhance the honor, reputation, and usefulness of the profession. 10. Treat all persons fairly regardless of race, religion, gender, sexual orientation, disability, age, or national origin. 11. Demonstrate respect for students and professional colleagues, never tolerating harassment. You know, if licensing organizations ever adapt to the 21st century and include social media postings as part of character verification, there are going to be a LOT of people who will not be allowed to sit the PE or P.Eng. Exams, including the boneheaded author of this tweet. Two, not only is this missive sexist as <CENSORED>, it is about as sophisticated and mature as a middle-schooler. Is this how you want to be seen publicly, as people, as professionals? Again, it comes back to understanding that when you're in a position like Engineering Republic, in the public eye, you are a face the industry. It also means understanding that EVERY time you post ANYTHING on social media platforms, you are representing the industry, especially to younger people. Whether we want to admit it or not, there is a certain stereotype that follows engineers as a group, including the generalization that engineers suffer from "arrested development" in terms of social awareness. It isn't fair or accurate necessarily, but it is real. 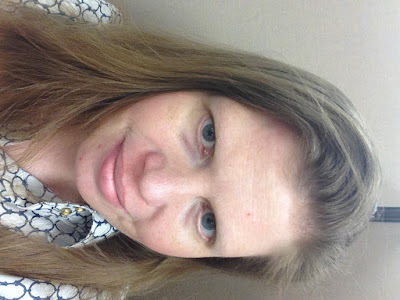 One way to widen the outreach and appeal of the profession is to dispel such stereotypes. Many young women AND men may be following Engineering Republic and, upon seeing such sexist, crass, childish noise, step back and think, "Hey, maybe those stereotypes of the misogynistic, culturally stunted engineer really are true..."
You want to know why women won't join or stay in STEM careers? This is a shining example. It implies a power dynamic that should never exist in a workplace, or anywhere else for that matter. No amount of awareness videos, sensitivity training, or HR policy enforcement is going to change this kind of ingrained cultural paradigm. While I still hold on to hope that individuals who think like this are the exception, I continue to be concerned about how women can be welcomed and their work appreciated in the engineering locker room. Jokes like this create the potential appearance of an environment of hostility, and perception is reality in the public eye. 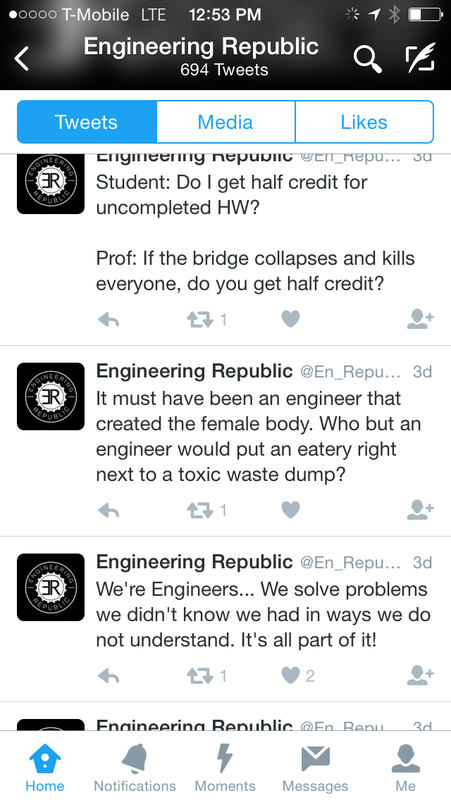 "If Engineering Republic is willing to disrespect all women so casually on its Twitter feed, what chance do I have of being respected on the job, and not being considered a mere piece of meat," a young woman in (or considering) the profession might reasonably wonder. Q: How do you know the human body was designed by a civil engineer? A: Who else but a civvie would build a recreation area right next to a toxic waste dump? Puerile and scatalogical? Yes. Juvenile? Sure. Funnier and less crass than the aforementioned tweet? Possibly. Non-sexist? Most importantly - YES! There is no need to hit below the chastity belt. Doing so renders moot the claims of #equality and #intelligenceissexy.